African Killer Bees Swarm Florida..
Well if that doesn't get your attention what would. What I am trying to say is now the State of Florida Is considering any feral bee colonies south of I-4 to be some what Africanized. This means a lot of different things. It means that it could affect our Europen Honeybees that are used to pollinate all the orange groves might be in competition with the Africanized bees. See here are the questions that people ask me all the time. How can you tell if a colony is Africanized? Well there is really no way to tell with the naked eye. It is usually based on behavior and aggression while in the field. Why are Africanized Honey Bees (AHB) called Killer bees? The AHB venom is no different than the European Honey Bee (EHB) it that when the alarm pheromone goes off in a colony the AHB sends 2/3 of its colony to protect the hive as the EHB only sends about 1/3 and the AHB is extremely more aggressive. Do the bees have to be killed? Yes the State of Florida recommends that all feral bee colonies be exterminated South of I-4 in Florida. Why don't we learn to live with the AHB? AHB colonies are very poor pollinators and are also very poor honey makers and there aggression is yet another point. Can't I just kill them with wasp spray? No that is highly not recommended. You will not stand a chance without proper safety equipment and methods. Recently Nuisance Wildlife Relocation Inc. owners Jeff and Christy Norris along with Technician Cory Young completed a course on the AHB put on by DR.William Kern from the University of Florida. Certifying them in AHB Management. Since Hurricane Charlie made land fall on August 13, 2004 we are still feeling the effects, I am not talking about the rebuilding or the financial impact, I am talking about the environmental impact. I remember hearing the news that Charlie was going to make land fall in Port Charlotte, FL, which is in our service areas. I talked with my wife, Christy, and we discussed that the area was going to be so busy with wildlife invasions because of all the damage and wildlife displacement. Boy was I wrong, Wildlife invasions were the last thing on peoples minds. Houses were damaged so badly that even if we were able to retrieve the animals they would just find another place to get in. Once the major renovations began most of the animals and wildlife left on there own due to all of the noise and commotion from rebuilding. So, this brings us to our current problem. Everyone was focused on structural damage and no one thought about the environmental impact that Charlie would bring. Not only were residential and commercial homes destroyed but also all the homes of wildlife were taken. Many animals did not find there way to safety, thus destroying the population for many species. For instance, from all the tree’s that were destroyed we lost an enormous amount of Squirrels nests. It was odd that over the next couple of years we did not receive very many squirrel jobs. Then come the fall of 2006, talk about squirrels, they came back with a vengeance, I haven’t seen so many in all my life. My company was handling more jobs from these little rodents in two days then we have had, the entire year before. We were literally going “nuts” with these calls, and they haven’t stopped. The reason that we started receiving so many calls is due to the fact that the squirrels were entering commercial and residential properties via the attic and nesting. We can replace structural damage, but only Mother Nature can grow the trees, thus leaving them no other options than to invade commercial and residential dwellings. 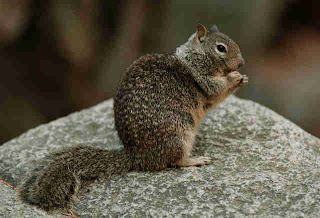 The problem lies is that a squirrel is one of the most destructive specie of wildlife in Florida. People ask why, it is because they are from the rodent family and need to chew to survive. Their incisors continually grow and need to be filed down. It is not like a squirrel can walk into a vet’s office and say I need a trim. So they chew on other things like the wood on your house, the wires in your attic and anything else they can get to. I have seen houses that had so much damage on fascia board that I wondered if the wind blew inside or if they had leaks. I have seen wires so chewed that I told the people that they needed an electrician to fix them before re-entering the building. To give you a for instance, New Years day, I believe in 2003 when I received a call from a man in Sun City Center. When I got there they told me that a squirrel had chewed the pipes in the attic and they had had a Plummer repair the leak. So I set some traps and I got a call at 7:00 am that I needed to get up there and there was a problem. I could not believe my eyes this squirrel had chewed another hole six inches from the previous hole and it had flooded the condo. Not just flooded but the ceiling had fallen in a bedroom and all the furniture was ruined. But they were happy that the little critter was in the trap. So with all the storms that this area has had in the past few years the squirrel populations is back with a vengeance. It is funny to think how Mother Nature adapts and changes things so species survive and strive in this so delicate environment in which we live. There's a stiff penalty for pigs rooting up yards in Manatee County, serving time at the Manatee County Jail farm. It's a life sentence for wild hogs after they were trapped and taken to jail after destroying yards in Manatee County neighborhoods. Ridgewood resident Virginia Heatley said this isn't the first times the hogs have hit. "It started here in the backyard closer to the house," Heatley said. But there's good reason the hogs are on the move. Booming growth in north Manatee is forcing them out of their natural environment. 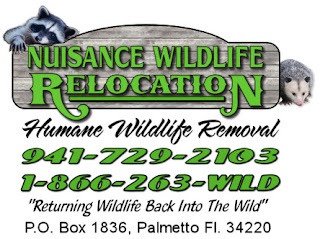 It's a problem Jeff Norris with Nuisance Wildlife Relocation deals with almost daily. "I've seen acres upon acres torn up in certain areas," Norris said. So Norris sets up corn-filled traps in hopes of catching the culprits who have no place to go but the pen. "Well, Florida statute says we cannot release any non-indigenous species into the wild," Norris said. So it's off to jail for the hogs and back to some serious yard work for residents like Heatley. The pigs tore up yards in north Manatee County. "It's hard to put it back together again," Heatley said. And a hard-knock life for the hogs. It doesn't cost the jail anything to house the hogs. They're fed leftover food from the inmates along with grain, a byproduct of grits made at the farm. Once they're plump, you'll likely find them at a barbecue. The Manatee County Jail farm has a meat processing plant run by inmates. Many times nuisance wildlife relocation will pay to have a few hogs processed. The meat then goes to needy families in the area. Spring is when Florida’s alligators start getting active, and the Florida Fish and Wildlife Conservation Commission (FWC) is urging Floridians and visitors to be cautious when having fun in and around water. Alligators abound in all 67 counties and have shared marshes, swamps, rivers and lakes with people for centuries. But because more individuals are seeking waterfront property and water-related activities increase during the warm months, people should be alert when they are in areas where alligators could be present. Closely supervise children when they are playing in or around water. State law prohibits contact with alligators, and it is against the law to feed them. There are other precautionary measures people should take to reduce potential conflicts with alligators, and they are available in the “Living with Alligators” brochure at MyFWC.com/gators. The FWC annually receives more than 18,000 alligator-related complaints. The agency removes more than 7,000 alligators each year when the reptiles present danger to people or property. If you encounter an alligator that poses a threat to you, your pets or your property, and the alligator is more than 4 feet long, call the FWC’s toll-free Nuisance Alligator Hotline at 1-866-FWC-GATOR (392-4286). The telephone number is the primary contact for all alligator complaints and is available to customers 24 hours a day. Alligators are an important part of Florida’s heritage and play a valuable role in the ecosystems where they live. Visit MyFWC.com/gators for more information on alligator behavior.